The Writing Task 1 of the IELTS Academic test requires you to write a summary of at least 150 words in response to a particular graph (bar, line or pie graph), table, chart, or process (how something works, how something is done). This task tests your ability to select and report the main features, to describe and compare data, identify significance and trends in factual information, or describe a process. 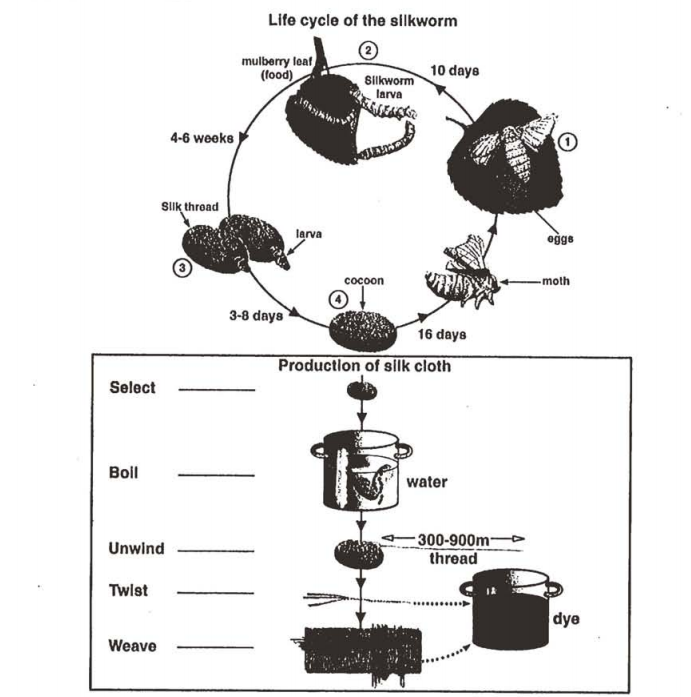 The diagrams show the life cycle of the silkworm and the stages in the production of silk cloth. Summarise the information by selecting and reporting the main features. The diagrams illustrate the stages in the development of a silkworm as well as the manufacture of silk cloth from its cocoons. Overall, there are four stages from egg to moth, and five steps in the production of cloth. Initially, the female moth deposits her eggs on a mulberry leaf. Ten days later, silkworm larva hatch out and consume the leaf as food. They do this for a further four to six weeks before beginning to spin cocoons from silk thread. This process usually takes between 3 and 8 days by which time, stage four has been reached and the cocoons have been finished. A further 16 days later and a mature moth emerges from its former casing to once again lay eggs on a new mulberry leaf. The production of silk cloth may only happen at stage four when the larva is still encased in its cocoon. The first step to making silk cloth is to choose the best cocoons. Following this, the chosen cocoons are boiled in a large pot of water in order to cause the silk thread to ease around the outside. Once boiled, unwinding may begin. A single cocoon may produce between 300 and 900m of thread. This is then twisted and passed through dye, so that finally it may be woven into cloth. The introduction can be included with the overview. State the outcome of each process. Begin to think about alternative synonyms and word forms for language used in the diagram. Remember to show the progression of time between stages. “After 16 days” may also be written as “A further 16 days later”. Begin with the silk moth life cycle stage to relate two processes together. This can then be easily supported using sequencing information necessary for this second process. The additional information regarding how much thread is produced may be included as a supporting sentence. While the chosen cocoons are in the boiling water, you can see thread unwinding from the casing. We mention this here as “easing” or other terms such as “loosen” may also be used. Use sequence words to show the process progression to completion. Fill in the gaps with the words or expressions in bold used in the model essay above. Each sentence in the report below contains one or two errors. Errors may be grammar or punctuation based. A list of the common errors used with answer is given at the end. The diagrams illustrate the stages in the development of silkworm as well as manufacture of silk cloth from it’s cocoons. Overall there four stages from egg to moth, and five stages in the production of cloth. Initially, the female moth deposits her eggs on a mulberry leaf. Ten days later silkworm larva hatch out and consuming the leaf as food. They do this for a further four to six weeks before beginning to spin cocoon from silk thread. This process usually take between 3 and 8 days by which time, stage four has been reached and the cocoons have been finished, a further 16 days later and a mature moth emerges from its former casing to once again lay egg on new mulberry leaf. The production of silk cloth may only happen at stage four when the larva is still encasement in its cocoon. The first step to making silk cloth is to choose the best cocoons, following this the chosen cocoons are boiled in a large pot of water in order to cause the silk thread easing around the outside. Once boiling, unwinding may begin. A single cocoon may produce between 300 and 900m of thread. This is then twisted and passed through dye. So that finally it may be woven into cloth. Initially, the female moth deposits her eggs on a mulberry leaf. Ten days later, silkworm larvae hatch out and consume the leaf as food. They do this for a further four to six weeks before beginning to spin cocoons from silk thread. This process usually takes between 3 and 8 days by which time, stage four has been reached and the cocoons have been finished, a further 16 days later and a mature moth emerges from its former casing to once again lay eggs on a new mulberry leaf. The production of silk cloth may only happen at stage four when the larva is still encased in its cocoon. The first step to making silk cloth is to choose the best cocoons. Following this, the chosen cocoons are boiled in a large pot of water in order to cause the silk thread to ease around the outside. Once boiled, unwinding may begin. A single cocoon may produce between 300 and 900m of thread. This is then twisted and passed through dye. So that finally it may be woven into cloth. Paraphrase the question & state key details. If you have many grammar/spelling mistakes, you could check your work sentence by sentence to help you quickly reduce them. Otherwise, you should spend a few minutes at the end of the writing period to check for the following.